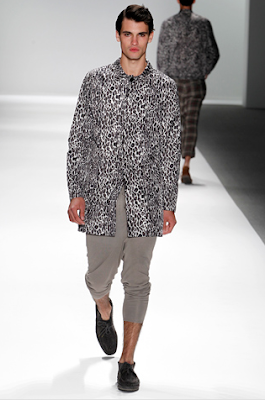 Jetlag and a slew of security checkpoints at the Lincoln Center hub for NYC Fashion Week did nothing to tarnish your shine on this day. 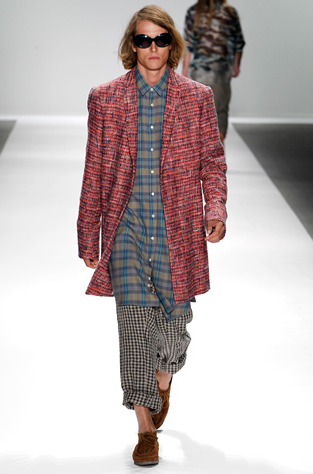 Designers Steven Cox and Daniel Silver of Duckie Brown saw to that with the 25 looks they sent forth to a bumping club mix, which included the slightest tickle of AC/DC's "Thunderstruck" riff. 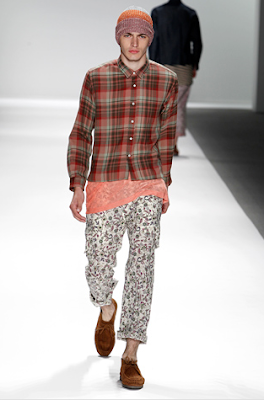 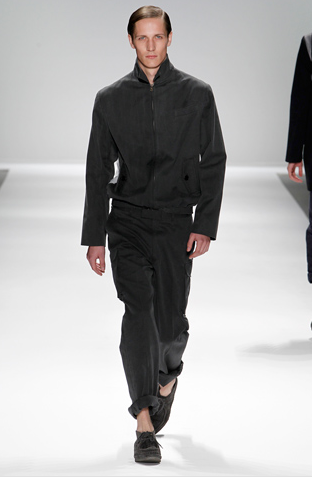 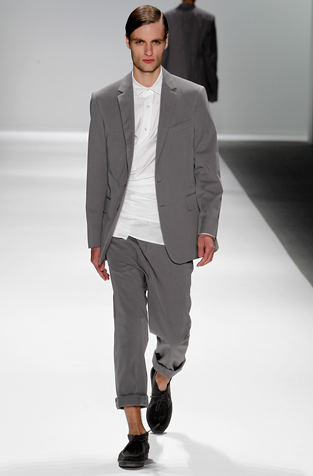 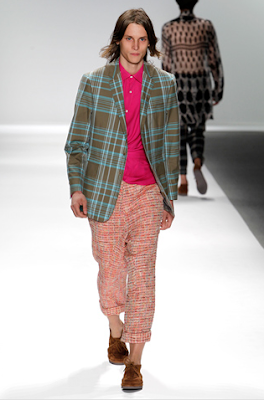 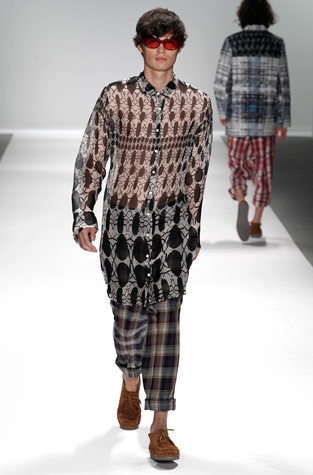 Duckie's Spring/Summer 2011 collection was, for the most part, a rapid-fire dose of patterns, prints, and colors. 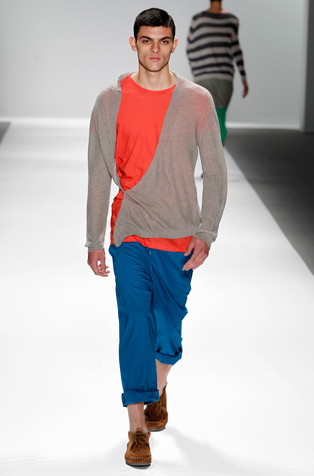 Overlong sheer tanks were wisping, plaids and stripes were intermingling, and there were low crotch sweat pants in electric colors. And lest you forget, there was a bug thing going on, and not just in the prints. 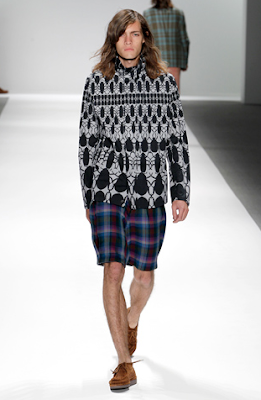 Adding to the insect feel were beanies pulled close over sunglasses resembling the compound eyes of an arthropod. You brought your sense of humor, of course, so you were loving it. Enlarged tailored jackets, like a dark-pink tweed long coat and an olive/turquoise check two-button, were worn over a long shirt and a wrap shirt, respectively, for a particularly hip feel. 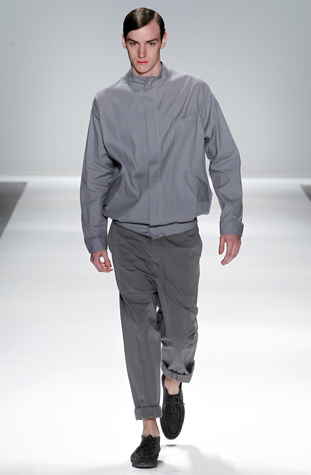 However, those wanting something a bit more conservative needed to look no further than the light grey two-button suit or the dark grey canvas Harrington and cargo trouser.